Among many other things, social media has brought us the concepts of the the flash mob, the tweetup, and viral video. It’s also popularized and legitimized the concept of guerrilla marketing — a low-cost, unconventional, and sometimes risqué form of promotional marketing. Social media provides local businesses a very effective means to engage with local audiences — local businesses may know their customers by their first names, they share a common environment, and so on. Guerrilla marketing can leverage this familiarity with one’s target audience along with the power of social media to generate buzz and amplify your brand message. 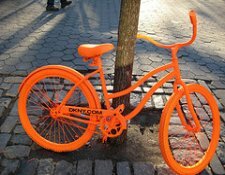 Here are three fun and effective guerrilla marketing ideas for local businesses. Use these ideas to get you thinking about how you can market your business in creative new ways. 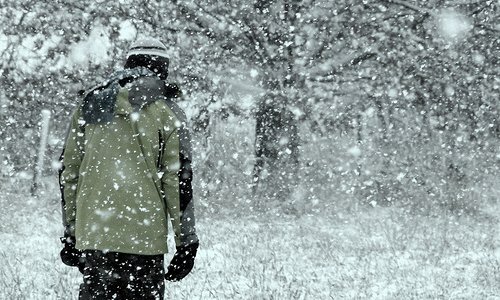 Depending on where in the world you are reading this, you may or may not be familiar with the concept of a snow day. That’s when an unexpected snowfall brings a city to a standstill, generally wreaking havoc on people’s normal workday schedules. If you run a local business, you are perfectly positioned to take advantage of such an event with a little creative guerrilla marketing. For example, if you sell winter clothing (or snow tires), blast out a “Snow-Day Special” and use a big, one-day-only discount to entice people into your business. Use a Twitter hashtag specific to your city to expand the reach of your tweets, or post local forecast updates to a city-centric Facebook Interest List. Use your intimate knowledge of your local environment and your local followers on social media to build a buzz around your activities. Have some fun with it. Encourage your fans to get in on the act too. Take detailed notes and measure your engagement metrics so that you can fine-tune your campaign for the next time a guerrilla marketing opportunity arises. By the way, this guerrilla marketing idea also works well for heat waves, localized blackouts, wind storms, or any unexpected or impromptu local event! Is there a local event happening in your community that also happens to attract people in your target audience? For example, is there a conference going on at a local hotel or a trade fair with attendees who might benefit from your products and services? If so, here’s a way to drive at least some of those event-goers to your website, or any online property where they can find out more about your business. 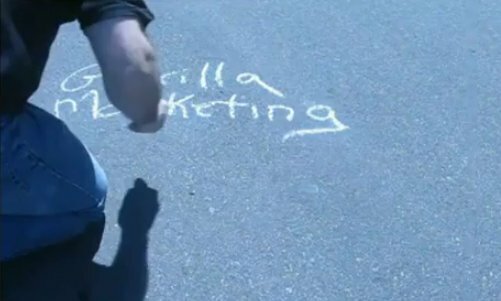 In the parking lot or on the sidewalk near the event, simply write your website address using a jumbo-sized, neon-colored stick of chalk. Curious attendees may use their smartphones to visit your website right away, others may remember the URL and go to your site during an intermission in the event or after the event is over. Get creative with this idea. Point your chalk URL to a customized Facebook Landing Page where you offer a special that appeals to the specific attendees of the event. Or register a catchy domain name that incorporates relevant keywords from the event. You could even use a QR Code generator, print out a customized QR Code for your website and hire a local artist to render the QR Code in chalk on the sidewalk! Note: Be sure to consult your local bylaw office to make sure you’re not in contravention of any local graffiti or signage laws. Always return after the event to sweep away the chalk and put the sidewalk back to its pristine state! The Internet is filled with viral videos of people doling all kinds of crazy, funny, amazing things. Why not take some of these ideas and bring them to your local environment where people may not be familiar with the content. The video above provides a great example. Even if some of your target audience has seen this video on YouTube (it’s got over 7 million views), can you imagine the impact something like this would have, live, in your community? Capitalize on the fact that so many people have camera phones these days. Whatever spectacular guerrilla-style event or display you have planned to promote your business, make sure to include strategic brand, logo and product placements wherever you think your audience may be taking pictures. You can even get the ball rolling by taking pictures and video of your guerrilla marketing promotion and uploading these to your various social media outposts like Flickr, YouTube, Google+, Pinterest, and so on. If your promotion draws a crowd, don’t be shy — alert the media! These types of stories are great fodder for slow news days and who knows, you might even get on the evening news! Have any other great guerrilla marketing ideas that might work well in a local environment? Let us know in the comments below.